Younger children may not always understand the importance of sleep. Even if your little one is a good sleeper, there could be an occasion here and there when they may put up a little resistance. It's nice to have books on hand like God Gave Us Sleep to show children the many reasons why it's so important to get a good night's sleep. Little Cub is having so much fun building an igloo with her friends that she doesn’t want to stop for bedtime! Who needs sleep when there’s fun to be had? Mama patiently answers her child’s questions as she puts her to bed, explaining the importance of daily rhythms of work, play, and rest. 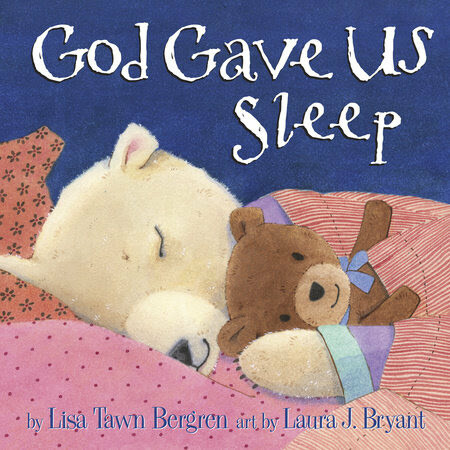 As they talk through the fears that come with nighttime—and work through Little Cub’s endless stalling tactics—our favorite bear learns to realize that God gave us sleep as a vital gift. This charming addition to the best-selling God Gave Us series, with its Arctic characters and relevant message, will help all little ones prepare for a peaceful night’s rest. God Gave Us Sleep can be read during any time of the day, but it is especially helpful to read it right before bed. Children often get so excited with play and everything else going on all around them throughout the day. With all that excitement, they may be surprised when bedtime creeps up on them. When it does, they're not always mentally ready, even if their bodies are tired. Perhaps they are worried that they're going to miss something, or maybe they're afraid of having a bad dream. God Gave Us Sleep covers a lot of these topics in a sweet story. We also see what happens when Little Cub doesn't get a good night's sleep the night before. This gives children more understanding as to why God created sleep, and how vital it is for everyone, both adults and kids. Adults can also relate to Little Cub's antics of trying to stay up just a little bit longer (asking for a glass of water, having to go to the bathroom, and the "one more story" request). There's also an area in the book when Mama Cub prays with Little Cub to keep away scary dreams. We only own this book, but would love to pick up some of the others in the series. The illustrations are colorful and depict Little Cub going about his day, running, playing, and of course trying to sleep. The biggest plus of all is that God Gave us Sleep actually has a moral to the story, which creates a fantastic learning experience for children.